I finished the stitching on my ornament a few days ago. I have not done the finishing yet. It's the end of February - an extra long one with the Leap Year, but the end of the month anyway. The March Featured Stitchers are posted - go check out their blogs!!! I never fail to be impressed at how talented and diverse our fellow stitchers are. Check out these blogs and the blogs of all our different contributors. If you're new to the blogging community or haven't made the rounds lately, now is as good a time as any to see what's been going on. Don't forget that every month, new stitchers are chosen at random to be our featured stitchers and have their blogs or online photo albums highlighted for the month. If you are currently on our contributor list, you are eligible to be a Featured Stitcher. If are NOT on the list but you have a blog or an online stitching album, please let me know about it and I'll include you. Remember, it's never a requirement to have a blog or album, but it is a fun way to get to know each other. I will periodically remove inactive blogs from the Contributors List. If a blog hasn't been updated in more than 4 months, it gets removed so that readers of this blog are getting links to current stitching blogs. Also, if you change your blog address, please let me know so I can update the links. The March Themes have also been posted, and the February ones will move into the Archives tomorrow. This months themes are Sheep, Snowmen and Trains, and I've compiled a list of freebies for your enjoyment. (As always, you're free to stitch whatever you want and are not restricted to these themes). If you come across any other freebies, please let me know and we'll get them added to the list. Freebies are a nice way to try out new designers, and since the charts are usually small ones, they work great for ornaments. And one last PS - please remember to label your posts and give credit to the designers / sources of your patterns. Taken from a UK magazine and stitched with DMC threads. Button attached is one I made. Placed inside a tuck pillow. This is my second finish and I did enjoy stitching this - it is a new design from TLC Designs Canada I did it as the kit stitching on white 14ct aida and using the threads in the kit the finishing was a bit awkward so I did my own thing and I was pleased how it turned out especially the pic taken in the garden. I bought 3 of the kits from Alexandra Palace last year so 2 to go. Everyone has done beautiful ornaments for February! Love them all! 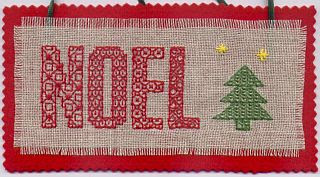 I have been busy stitching every day, but haven't decided on my next ornament as yet. This SAL is great! Hi Everyone, My February ornament is a freebie I found somewhere on the net. Stitched on 27 count Linda Evenweave with DMC variegated threads 115 & 94. 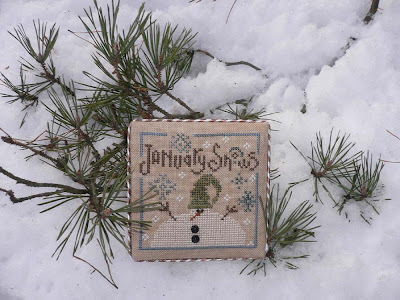 The card pattern is from a hard cover book called 'Two Hour Cross Stitch' by Patrice Boerens and is stitched on 25 count Lugana with DMC Threads. Ready to start March ornie & card. Here is "Winter Love" finished into a pillow-style ornament. 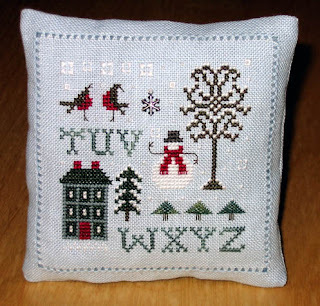 I had originally intended to make this into a tuck-pillow ornament, but after I trimmed my stitching I realized I didn’t really leave enough room for the "border" that characterizes a tuck-pillow so I just fell back on a regular pillow-style ornament instead. Turned out cute, no? 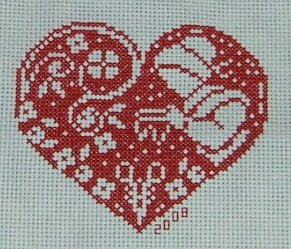 This was a freebie by Lorraine Niesy I found on Cyberstitchers. I did this one in my favorite colors of blue and silver, added a little silver crown and some star sequins. I stitched it together with a beaded edging during the Oscars, and yes, it took me almost the whole ceremony to stitch it. This was my first time whipstitching with beads, and guess what? It's harder than it looks!!! (I hope it gets easier with practice!). I stitched this one twice because I wanted to see how it looked on two different fabrics. 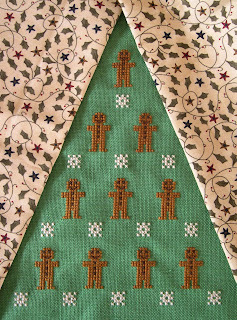 The design is Christmas Tree 2007 by Jeanette Douglas from the 2007 JCS Ornament edition. The one on the left is stitched on 28ct Raw Opalescent. The one on the right is stitched on 32 ct linen. Sorry for the blurry picture. If I have time later I will take a better picture and replace it. 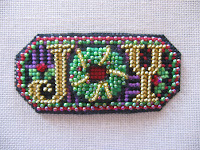 This ornament is a quick stitch (about 5 hours each). 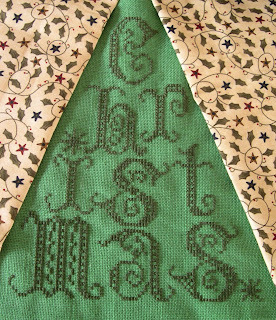 I stitched it as designed except for removing the year and then centering "Christmas". 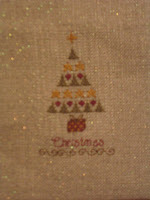 I went on stitching on my christmas trees from TPS. This time I can show you 4 of them, 2 for february and 2 as march-ornament. Here is my Bent Creek Ornament. I like this Benk Creek calendar. I've stitched it on Vintage Linen with Weeks Dye Works threads. This weekend is our Monthly SAL weekend!! Some of you are already heading into Friday afternoon / evening, so make sure you've got your charts ready and your supplies kitted up for this weekend's stitching! Thank you for allowing me to join. 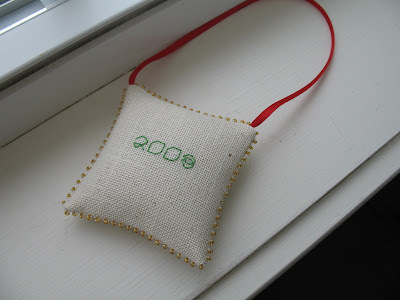 I started doing some ornament (since they were small) to get back into stitching again. I hope to do some of my ornaments for charity. I just finished a watermelon heart and am just starting a wreath heart. I think I'll have that be my February ornament. I'm also working a mitten from a freebie site (http://pagesperso-orange.fr/anne-les-petites-croix/ouvragescommuns/vos_creas) It's in French, but as they say a picture is worth a thousand words. This upcoming weekend - February 23 and 24th - is our monthly SAL weekend. Start thinking about your ornaments and gathering your supplies so you're all ready to stitch this weekend. If you still can't decide what to stitch, take a look at our themes this month. We're featuring "Love", "Music" and "Winter", and there's a whole bunch of freebie charts to check out. Of course, you don't HAVE to stitch these themes, but you can use them as a starting point or to help you narrow down your choices. If you're confused on what to label your posts with, the left side bar has a link to tips on labeling your posts. You can click on the "Show All" option next to the label box at the bottom of your "New Post" screen (where you enter your posts). That will bring up a list of ALL the labels used so far on the blog and you can just click on the ones you need. Blogger also auto suggests labels as you type in the label box, so you can do that too. Don't worry if your label is not auto suggested or contained in the list - finish typing it in and it will add a new label. And if you forget to label, you can always go back later and edit your post. I've been trying to fill in missing labels along the way as well. If you have any questions, just let me know and I'll be glad to help out. I first saw this free chart from A mon ami Pierre's I knew I must stitch it. It's stitched 1/1 on 25ct cream evenweave using DMC 75 and I'm so pleased with the finished piece. I've finally finished the ornament my daughter requested from the 2007 JCS ornament issue. She picked out the trim - and the fabric is one of Sassy's Fabrics. The fact that I posted February's ornament before January's ornament is more typical of my life than I truly care to admit! I had finished stitching this one a few weeks ago, but just now got to the task of trying to find a suitable adornment for the centre. There was nothing suitable in my bag of tricks so I am now declaring this one finished. 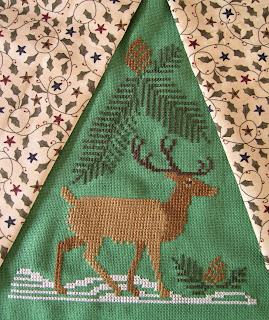 This is the bargello star ornament by DebBee's Designs in the 2007 JCS Christmas ornaments. I had to fudge some of the threads as well because I do not have any access to Weeks Dyed floss nor did I have any of the Kreinik braid called for so my version is a little bit different looking than the version on the cover of the magazine! 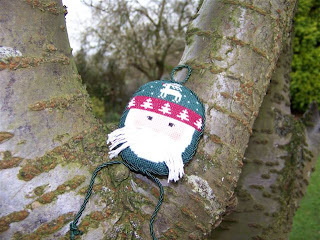 I have been slow at stitching ornaments for this blog, but here is the one I have done for January. Thanks to C. at mtrlgirl for the pattern! Hello All! I am new to this Christmas Ornament SAL, but I joined as a way to keep myself motivated for a Christmas Ornament Challenge that I have set for myself. Today I finished the stitching for my first ornament. 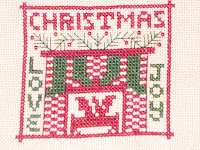 It is "Winter Love" by SamSarah Design Studio and can be found in the JCS 2007 Christmas Ornament issue. I currently don't have any fabric to finish it into the tuck-pillow ornament that I have planned, but as soon as I get some I will. One of January's themes was JOY. This is a Lizzie Kate freebie that Jennifer had listed on the sidebar. 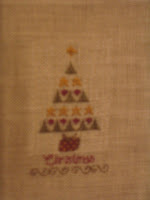 Some of the other stitchers made the pattern as intended with a star in the top border. I liked the border so much, I continued with it. Enjoy your stitching. I just completed my February Ornament. It is called Cranberry Christmas, designed by Pamela Smith of Prairie Schooler. It can be found in the 2007 JCS Ornament edition magazine. I stitched this on 28ct Lambswool Jobelan. I made a couple of modifications to the the design. First I used DMC Ecru instead of white because I wanted a softer contrast. I replaced the date on the left of the fireplace and the letters ABC on the right of the fireplace with two emotions I associate with Christmas, Love and Joy. I added a forth stocking and finally I used beads instead of cross stitching the cranberries that are located within the greenery on the mantle piece. I will finish this ornament with either a green or red felt backing and matching ribbon hanger. 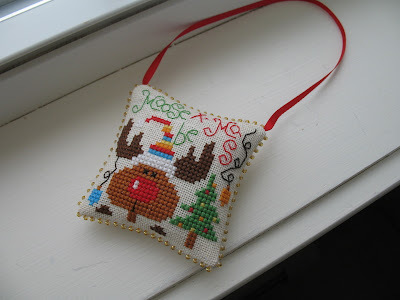 This was a fun ornament to stitch once I decided on all the little modifications. This is a late post of the 2 ornaments I stitched last month. The first is the 2005 JCS Olde Colonial Ornament. I am waiting on the frame and charm to finish. In the right sidebar, I've listed tons of freebies by theme, as well as some sites that host multiple freebies. 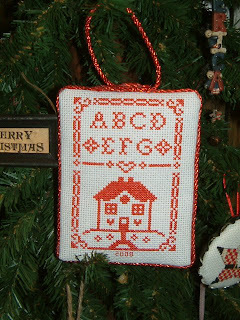 There's also a list of stitching themed pieces suitable for ornaments, and I've just added a new one, the Stitcher's Alphabet by Brooke's Books. It's not complete yet, but she has some really adorable designs that feature all kinds of needlework and fiber arts themes. Go check them out! This is my January ornament. I finished it last night at 11:55 pm. 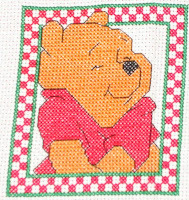 It is a little kit I had and I wanted to stitch this for my 15 month old grandson. This was fun and easy to stitch but took a lot longer than I thought it would. 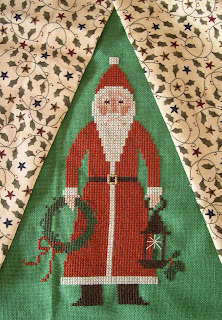 When I 'finish' it I will use red felt backing and a green ribbon for the hanger. Thanks for looking. I had seen the chart for Puppy's First Christmas a day or two before I joined the SAL and was planning on doing it anyway, but I probably would have put it off for months and months. I'm glad I had something to get me to do it now. I used white 14 ct Aida and I changed the colors a little. You can find the free chart for Puppy's First Christmas at The Chart Shop.